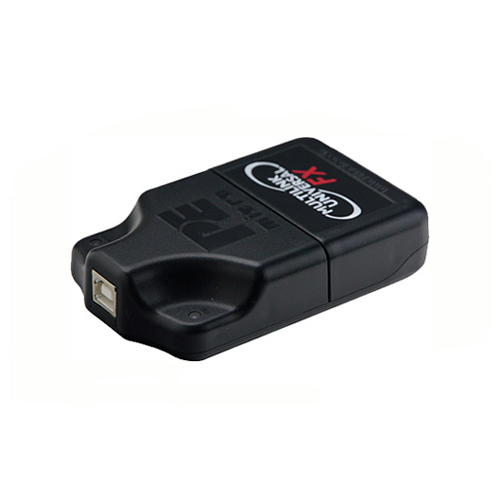 - USB interface from PC to Multilink allows for fast, easy programming and debugging -- with the ease and compatibility of the USB interface. - Draws power from USB interface-- no separate power supply required (draws less than 1mA from the target). - Target Frequency: 16Khz-50Mhz (applies to HCS08,RS08,CFV1, S12Z, or HCS12X only). - Compatible with HCS08, RS08, HC(S)12(X), S12Z, ColdFire V1/+V1, ColdFire V2-4, Qorivva MPC5xxx, and Kinetis ARM families of microcontrollers. - Kinetis support includes both the JTAG and SWD protocols. - Includes USB cable, Type A Male to Type B Male, 6-ft.
- Auto-frequency detection + trimming capabilities for HCS08 devices. - Auto-frequency detection for HC(S)12(X) devices. - Generates programming voltage on RESET line for RS08 devices. - One (1) USB 2.0 High Speed Cable, Type A to Type B, 6-ft.
- One (1) 6-pin 0.100" pitch ribbon cable for connecting to RS08, HCS08, HC(S)12(X), S12Z, ColdFire V1/V1+ targets. - One (1) 14-pin 0.100" pitch ribbon cable for connecting to Qorivva MPC5xxx targets. - One (1) 26-pin 0.100" pitch ribbon cable for connecting to asynchronous ColdFire V2/V3/V4 targets. - One (1) 20-pin 0.100" pitch ribbon cable for connecting to Kinetis ARM targets. - One (1) 10-pin 0.050" pitch ribbon cable for connecting to Kinetis ARM targets (Mini-10). - One (1) 20-pin 0.050" pitch ribbon cable for connecting to Kinetis ARM targets (Mini-20). - The USB Multilink Universal includes a ribbon cable for connecting to ColdFire V2-4 targets, however the MCF5272 & MCF5206(E) devices will require a separate adapter cable (not included) to synchronize the communications signals (as these devices do not do this on-chip). - Windows 2000/XP/2003/Vista/7/8 with USB 2.0 software support. Requires a USB port on the PC.